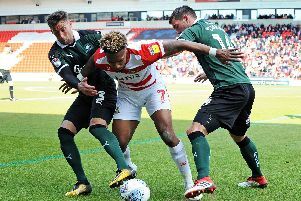 Darren Ferguson says he will keep an open mind about the formation he uses for Doncaster Rovers next season. Ferguson initially favoured a wing back 3-5-2 system in the early days of his Rovers tenure but finished the season playing a 4-4-2 with a diamond midfield. And he says there are plenty of factors which will influence which will be his favoured formation in League Two next term. “There’s certain things that you’ve got to look at. “We never won away from home last season with a back four and those are the sort of stats I’ve got to look at. “And you’ve got to look at the teams that have come up from League Two and what they did. “Northampton played 4-4-2, Oxford were 4-4-2 and Accrington, who did really well, played a 4-2-3-1. “You have to look at how other teams got out of the league. “I’ve got a certain way I want to play but I’ve got to be flexible as well, same as last season. Ferguson admits he may have had too much faith in his players that they could play in the 3-5-2 system last season. And he says he realised it was not working a few weeks too late. He said: “We went through a period where maybe I was too loyal to them or I had a little too much belief that they could do what I wanted. “I probably could have changed it earlier. The things I wanted them to do, I realised a week to two too late that they’d lost that much belief they could not do it. “We tried to change it and went with a more rigid 4-4-2 for the Peterborough game in March and got a good performance. “But I went 4-4-2 at Colchester on Good Friday, we got annihilated and I changed it again. “We played a three and we played a diamond. But it’s the personnel that’s most important. You’ve got to get the right players.